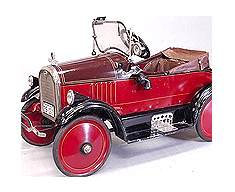 The glory days for American steel pedal cars lasted for many years primarily between the World Wars. 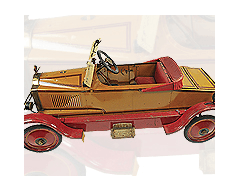 They were steady sellers in department store catalogs and toy stores across the country. Unfortunately, when ordered, they could only be sent to customers who lived near railroad tracks because mailing a steel car, even a small one, was simply not possible. 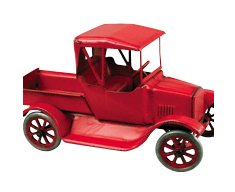 Today, we can ship anywhere, and we enjoy giving pressed steel trucks and pedal cars the rebirth they deserve: the supply of varied examples will astound you. 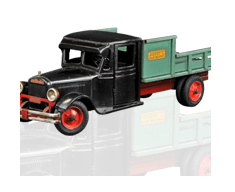 Buddy L, Keystone, Sturditoy, Murray, American National, and many more might just become your favorite scaled down toy. 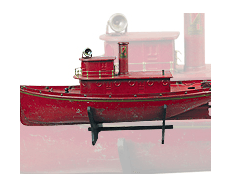 Buddy L Tugboat, extremely rare example painted in red, thought to be a salesman sample. Sold in Sept 2011. 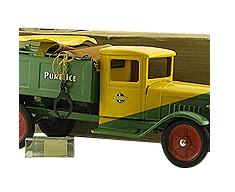 Near mint condition Buddy L Ice Truck w/box. Donald Kaufman Collection. Sept 2009.